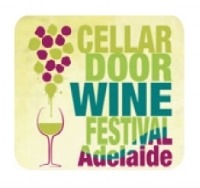 The purpose of this research was to take a look at possible users of Vin-ival and gain feedback on their past wine festival experiences and how they interact with wine in general. 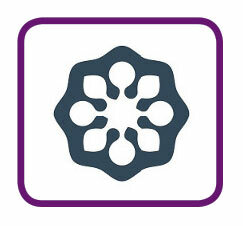 The goal of Vin-ival is to create a more enjoyable and in-depth festival and tasting experience for event attendees. Using Typeform, an online survey platform, I was able to reach out to 20 wine-drinkers of different levels of wine saavy. There was also a sampling of different income levels and ages, showing that wine festivals can attract a wide range of participants. 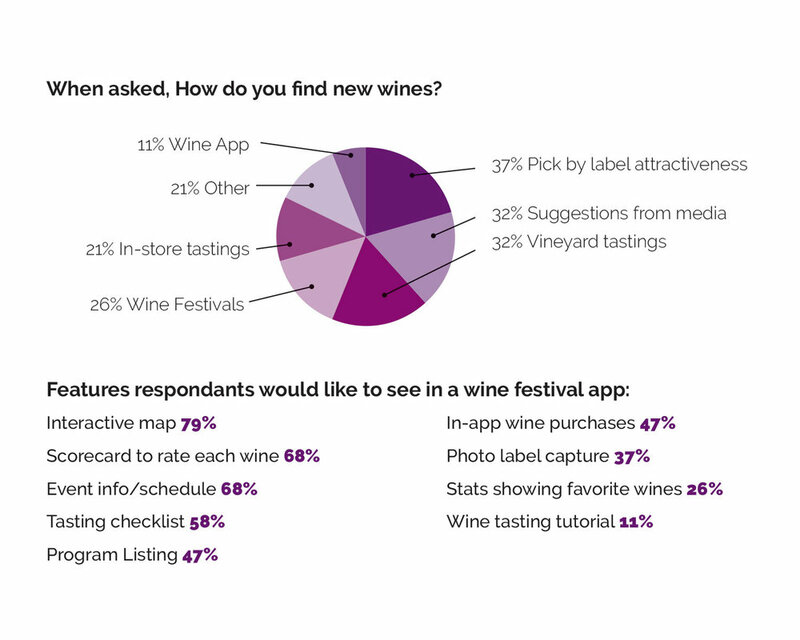 Results point to a potential to integrate an app to enhance the festival going and wine tasting experience. The pain points offered the greatest possibility for ideas to shape the app into solutions. One respondent disliked having to carry around bottles, which would point to an in-app purchasing and pick-up later option to solve this. Another mentioned getting too drunk, leading to a possible feature that with each wine checked off as being tasted, an alert might pop up after several which suggests the user drink some water. Of the two respondents who said there was a map/schedule, only one used it, the other said it was a little unwieldy to carry. The others don’t remember there being a map/schedule available. All respondents, when asked if they would make use of an app that offered map/program/schedule information, they would all use it. Three respondents said they would definitely make use of the in-app purchasing feature, while the other two preferred to pay with cash, but if there was a system to check wines to pick up later, they would use it. Four of the respondents said they used social media while at the festival in some way. Only one respondent made use of the winery provided paper menus for tasting to keep track of what she liked. The rest said they had no way to remember and one said she would try to remember them by their labels. All said they would be interested in using a tasting checklist that allowed them to keep track of favorite wines and three said they would use the camera feature to capture the labels. All respondents agreed that if it was available, they would most likely use an app that corresponded with the festival they were attending. While hitting the shopping bag, I was immediately taken to an outside site. This offers no way to get back to app without shutting down newly launched browser and re-opening app. Which when opened was left at a blank page. There was a home icon which led me back to the home page, but it was a long side-trip for accidentally hitting one of five large icons always present as navigation on bottom of screen. The app has very good minimalist design, there is no wasted verbiage/icons, every item has a purpose. After initial tour, there was no easy way that I could find to locate help, perhaps there isn’t a specific help page, but I would like to get back to page where I was initially asked to refine my taste preferences, and I’m not sure how to get back to that. The home page is a series of icons, with no branding. Makes it hard to tell if your on the actual home page. Each tap on an icon delivers you to a new page with new options and then to another page depending on what you choose. The back button makes you scroll back through all choices to reach home page - no nav to home on every page. No general nav on every page. Terms for MAP include both MAP and LOCATION PLAN. A little confusing. Checklist for wines is very long, requiring scrolling through alphabet, low efficiency of use. There is no notification that touching each vintner name will lead you to a page with their info on it. Info would only be found by accidental touch, and as far as not wanting to access that information, it is too easy to open the contact info when not meaning to. Main page has very small nav in top corner, but scrolling through intro text leads to another element that could be mistaken for navigation. Individual sponsor info pages and vintner pages do not link back to main page or to main navigation. A long scoll on listings. A search button is there for those who already know what their looking for. Vintners/Sponsors pages do not have headers letting you know what list you are looking at. Map of venues, the pindrops are almost same color as the land masses, they are almost invisible. This app did not load. After compiling the information from the interviews and I identified several personas and used their responses to flesh out quick studies on each of them. What were they thinking and feeling while at a wine festival and how did that inform their choices and affect their overall experience? A dive into their pain points and difficulties led to the creation of empathy maps allowed a look into the factors that could affect how they interact with the app. 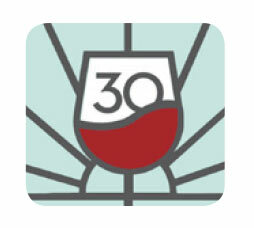 The card sort for the wine festival experience app began with recruiting four users that best exemplified the likely users and personas that have been previously identified. There were several classifications that ran through each users vocabulary. “About” “Info” “Purchase” “Interactive Map” all showed up through each users card sort. Some tasks that focused on interactions with the app during the actual tasting seemed to fall under the simple term of “tasting” which led to a change from “Wine List” to “Tasting List” in the site map. The word “Purchase” also took the place of “Shop” as none of my participants used the word “shop” which was a little surprising. Some of the tasks were very easily grouped, such as the ones that dealt with social media interaction. While others, like how to taste wine and rate the wine I’m drinking, seemed to fall into different categories. It was interesting to see how some participants came up with very different ways to classify one task. Keeping all of the feedback in mind, I created a site map that will hopefully allow for each user to navigate the app easily. Research is the key to unlocking a smooth user experience.